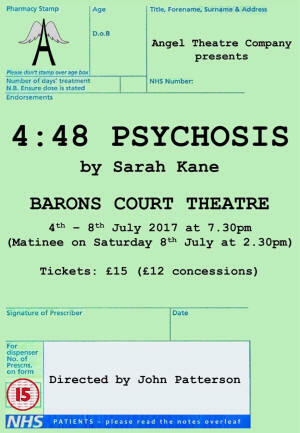 Angel Theatre Company present 4.48 Psychosis at the Barons Court Theatre from 4-8 July 2017. The State of Grace production is back in London, part of the Lewisham Fringe Festival on 13 and 14 Nov 2014. Visited the London Theatre myself last night and stumbled across this wonderful production of 4:48 Psychosis by The State of Grace. What a wonderfully honest account of Sarah Kane's play. Very moving and a pleasure to watch. Certainly would recommend it. Just saw it, highly recommended. More soon. "Trapped in a cage where life is nothing but pain and anger, where a single breath is murder and words are poison. Life is solitary and surreal. Only when the clock displays 4:48 are you in any state of recognition and yet it is so far from your once 'normal' self. Watch the last moments of existence unravel in a mirage of scenes which sees poetry and blastphemy, life and death entwined together. Controverisally suspected by some to be a suicide note, Darkness in Berlin brings Sarah Kane's epic play to The London Theatre, New Cross for one week only. Join us as we present our verision of 4:48 Psychosis." It is on from 2- 7 April 2013. No surprises there as Brian Logan is a well-known Kanephobe. I have to confess I haven't bothered reading any of the critics apart from happening on a (4 out of 5 stars) review when I flicked through one of the London free papers that someone had left on a train I was on. Brian Logan in Time Out on 30 Jul 2009 gave the play a really bad review (one star out of five). "... To this viewer, Christian Benedetti's production is like being locked in a padded cell for and hour-and-a-quarter with an unhappy and self-sbsorbed adolescent... One can hardly pretend to be interested". "... it isn't a good play in itself. It's just a sick and sad person shouting at us"
"This play is about suicide, but theatrically, it's murder". first, how was represented the suicide, the death, of the main caracter? In the death scene of the current production the actress simply delivers the lines, in a serene peaceful tone, at slow intervals. At a London performance in 2006 there was a noose with a chair beneath it on stage during the final scene, but nobody occupied them; the actors gathered in a corner reciting the lines in chorus, and the death was represented by the chair falling over (done with invisible wires). In every production I've seen one or several actors on the stage simply say 'please open the curtains'. In the original London run this was followed by black curtains, that had covered all the theatre windows throughout, being removed; in 2006 and the current run it is followed by blackout. 4.48 Psychosis is coming to London, UK. It is at the Young Vic from 25 Jul to 1 Aug 2009. If you haven't seen it yet, it's now running for one more week. I too strongly recommend this production. Anamaria Marinca, a Romanian actor, performs the play alone. She stands in the same spot on the stage throughout, just making the odd appropriate hand gesture and very occasionally crouching down on the rare occasions when she goes into a shout. The performance opens with Anamaria staring, fixedly and silently, for quite a long time, occasionally glancing one way or another. When she finally speaks the opening line "But you have friends" it seems to have the force of an explosion. Similar pauses are used to great effect at various points throughout. Most of the time she delivers the text in a tone of controlled anger, conveying a real sense of the stress of living with persistent chronic depression. Just a couple of times she breaks into angry shouts. She adopts a tone of cheerfulness (for both doctor and patient) for a scene where the main character mischievously talks to a patronising doctor about her self-harming. She adopts differing accents and tones of voice when portraying doctors, but in other two-handed scenes she simply maintains a constant tone and timbre, giving the impression of having a conversation with herself. Very effective. The 'to...' wish-list is delivered as an assertive series of demands. In Anamaria's portrayal, the therapist and patient scene is a watershed. From the moment that the therapist tells the main character they can no longer treat her, but assures her that she'll be all right (after snapping into a frustrated shout when they say 'I hate ths f**king job'), Anamaria switches for the rest of the play to a tone of sad resignation. Her interpretation makes it clear that that rejection by the therapist is the point where the main character finally, inexorably, gives up hope and resolves to commit suicide. It is a measure of Anamaria's achievement that she takes the play and makes it her own. Magnificent. "She demands that we find new means of representation, challenging us to find expression of the reality of our lives. And in this she is one of the great playwrights of the last century...Directing 4.48 is in some way for me like sending a letter in reply to the many that she has sent to me through her plays...the temptation of a winking eye." I saw it today, really good. More soon. Tickets go on sale from 2 Feb 2009. 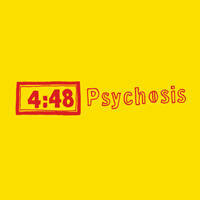 4.48 Psychosis is coming to London, UK. It is at the Young Vic from 25 Jul to 1 Aug 2009. The director is Christina Beneditti and the actor is Anamaria Marinca.